The Blackbird or Common Blackbird (Turdus merula) is a European member of the thrush family Turdidae. 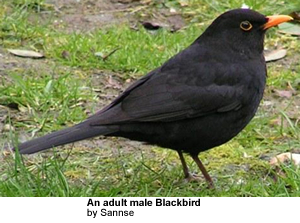 The blackbird is the national bird of Sweden. It is common in woods and gardens over all of Europe and much of Asia south of the Arctic Circle. Populations are resident except for northern birds which move south in winter. The Blackbird has been introduced to many parts of the world outside its native range. In Australia and New Zealand it is considered a pest and has an effect on natural ecosystems. Blackbirds are 23.5 to 29 cm in length. dult female birds and juvenile birds have brown plumage and brown beaks and do not have a yellow eye-ring. Juveniles are slightly lighter brown than female birds and very young juvenile birds have somewhat speckled chests. They are omnivorous, eating a wide range of insects, earthworms, seeds and berries. They nest in bushes or similar, laying several (usually 4) bluish- green-grey eggs with brown reddish marks in a neat cup-shaped nest. They do not form flocks, although several birds, especially migrants, may be loosely associated in a suitable habitat. Female blackbirds are especially fierce in the spring when they compete and fight with each other for a good nesting territory. Male birds are also competitive and will protect their territory by chasing away other males. If a fight between male Blackbirds does occur it is usually short and the intruder is soon chased away. The male sings its varied and melodious song from trees, rooftops or other elevated perches. 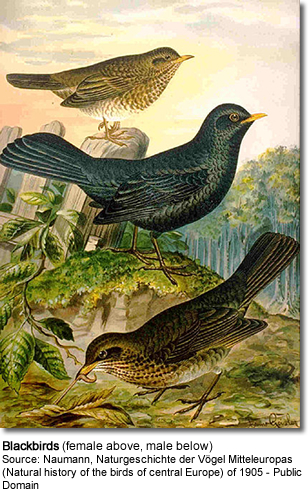 Two Asian Turdus thrushes, the White-collared and Grey-winged Blackbirds are named as blackbirds. The Blackbird and the two Asian species are not related to the New World blackbirds, such as Red-winged Blackbird or Red-breasted Blackbird, which are icterids, family Icteridae. The Blackbird's New World relatives are larger thrushes such as the American Robin, Turdus migratorius, and the Mountain Robin, T. plebejus.